Nate Johnson serves as a Senior Vice President of Development for Lyon Living. 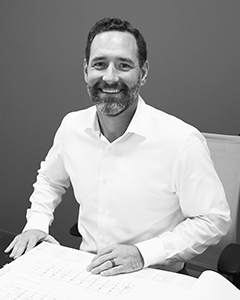 In his most recent role, Nate was Senior Vice President of Development for Clearwater Living, a senior housing developer, where he oversaw all aspects of development and construction for four new senior living communities located throughout the Western U.S. In his prior role as Vice President, Development at Irvine Company he was involved in the design, entitlement, and construction of over 5,500 multifamily units with the total development cost in excess of $2B. Prior to that he held several positions in project management for two of the top-35 general contractors in the U.S., specifically overseeing the design and construction of large commercial projects in Northern and Southern California as well as New Zealand. The wide variety of projects he managed had hard costs of over $500M and included a mid-rise senior assisted living community, Disneyland's California Adventure buildings, domestic and international airport terminals, several high rise office buildings, a public and private school, and a fire station. Nate holds an MBA from UCLA Anderson, a Master of Science degree in Civil Engineering from Stanford University, and a Bachelor of Science degree in Civil Engineering/Building Science from the University of Southern California.